of beneficial microbes. However, managing a pile takes time, space, a strong back, and the right kinds of organic materials to achieve the characterstics of quality compost. 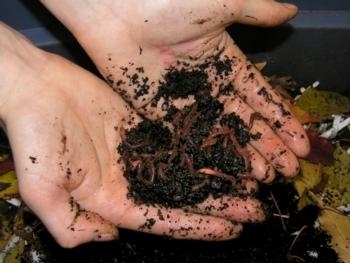 For those of you living on tiny urban lots with busy schedules or limited physical abilities, you can still turn food waste into an excellent soil amendment by harnessing the power of worms. Yes, you read that correctly: worms. I don't mean tossing food on the ground for worms and less desirable wildlife find. I am talking about vermicomposting, the process in which worms eat your kitchen scraps so the bacteria in their guts can break down nutrients into a form that plants can use. It is a tidy, contained system that recylces food waste, feeds the soil, and connects us with the circle of life (sans heart-wrenching deaths of cartoon lions). This amazing process requires a bin and a few other ingredients. People have used many different types of containers, and size depends upon how much food waste you produce. However wide the bin is, it should be no deeper than 12 inches. A bin measuring 2′ wide and 4′ long is good for a family of four. Make sure to drill holes 3/8” to 1/4” wide in the sides, top, and bottom. Elevate off the ground on blocks and place a drainage tray underneath to catch any drips (only overly-wet bins will have a lot of drippings). Next you need to get bedding. 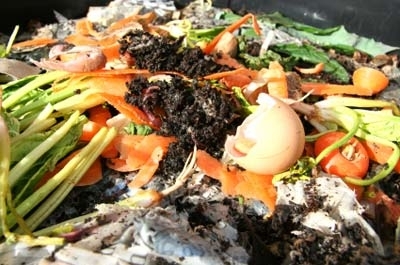 Bedding provides worms with a place to get away from kitchen scraps to reproduce; it also provides a food source if kitchen scraps are scarce (or unfavorable). The simplest source of bedding is shredded newspaper, but you can also use regular paper, corrugated cardboard, dried leaves (watch for chemicals), or coconut coir. Bedding material needs to be damp enough to feel like a wrung-out sponge. Add a handful of soil, which contains grit for their digestion. scraps for the first month or so until you can guage how much they will eat. Minimize pungent foods such as citrus and onions; speed up the process by chopping food into little pieces. Worms eat their weight in food every 5-7 days, but observe them carefully. As populations grow and bedding disappears (i.e. gets eaten), you can add more food. Be sure to bury food at least 1” deep to keep fruit flies away. Never feed them pet feces, non-biodegradable materials, or scraps with a high salt or fat content (worms will eventually eat salty/fatty items, but don't put in a lot all at once). 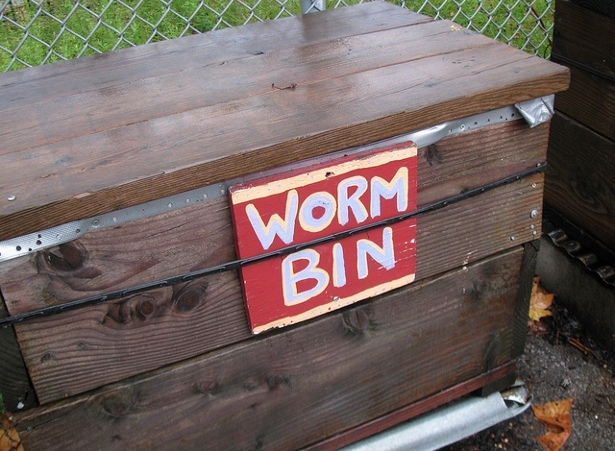 There are thousands of worm species worldwide, but only a few are good candidates for worm bins. Redworms (Eisenia fetida) are the the most common, as they live in groups, feed on organic matter at the soil surface (this is why your bin should be less than 12” deep), and lack feelings of wanderlust, making them ideal for closed quarters. Start with a pound of worms, which can be purchased at fishing supply stores or online. Be sure to cover the bin to block out light. Worms turn their bedding and kitchen scraps into a fine, dark material similar to ground coffee. The simplest harvesting method involves shoving the finished material to one side of the bin, placing fresh bedding and food in the empty side, and waiting for the worms to migrate. This could take several weeks and will never be a complete evacuation. Dumping the bin out onto a large, plastic sheet and scooping the vermicompost off the top (allow worms to work their way down by shining a lamp on the pile) is more thorough and allows you to evaluate whether you want to make any changes in your worm routine. Although vermicompost is great for any garden plant, it is especially beneficial for veggies. Apartment-dwellers can practice vermicomposting as well and use the finished product on potted plants or give it to friends with gardens. It's difficult to use too much; try to go with a minimum 1/4″ layer. You can scratch it lightly into the soil if desired, especially if you do not use mulch, which prevents it from forming a crusty layer in hot, dry weather. For more tips and tricks, see Mary Appelhof's excellent book on vermicomposting, entitled Worms Eat My Garbage (Flowerfield Enterprises, 1997).